A picket fence can add the finishing touch to your home. A timber picket fence can add the finishing touch to your home. When you build it yourself, with the help of Home Timber and Hardware, you can create the exact look you want. Your fence will keep the kids and family pets safely inside and keep unwanted guests outside, giving you the privacy you want. 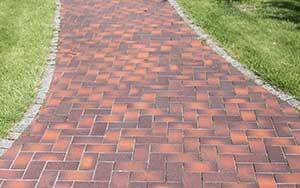 Choose a design that complements your home and garden, make sure you’ve got the right tools and materials, and you’re on your way. Planning the fence requires you to select the location, style and height of the fence, and to check with your local council if a building permit is required, or if there are certain regulations affecting your preferred style. In addition, it would be wise to have a registered surveyor do a site survey to ensure your fence will be on the correct boundaries. 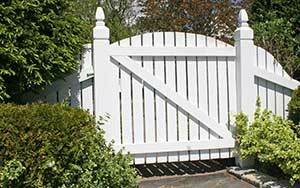 Don't forget to plan for a gate, and perhaps incorporate a new letterbox. 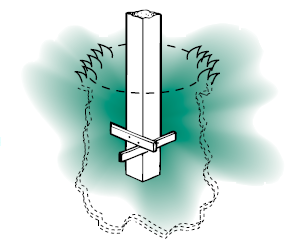 Determine both end post locations and hammer stakes in the ground to mark them. Run a string line between these to mark the fence line, then determine the gate post locations and also mark these. You can now mark out the locations of the intermediate posts at even spacings (typically 1.8 to 2.4 metres apart). Dig the holes for the end posts first, 300mm square and 600mm deep. If a picket fence is higher than 1.8 metres, holes should be deeper than 600mm. Place the posts central in the holes and attach two braces as shown. Plumb the posts with a spirit level and fasten the braces securely. If the soil is sandy then additional braces below the ground are required, as shown. Fill the holes completely with Premix concrete, or make up a cement-soil mix (6 parts soil to 1 part cement) and consolidate by hard ramming with a crow bar. 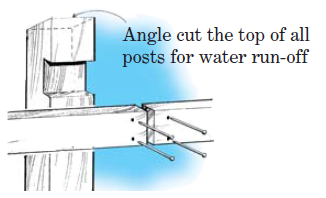 Check the posts with a spirit level and adjust to plumb if necessary. The top of the footings should be sloped away from the posts to drain away water. The remainder of the posts can be installed in the same way, using a string line to ensure that they all are in a straight line. 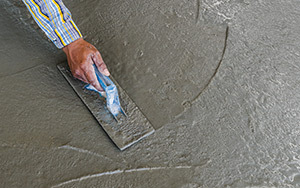 Allow a few days for the cement to cure before proceeding. The posts now have to be notched to fit the rails. 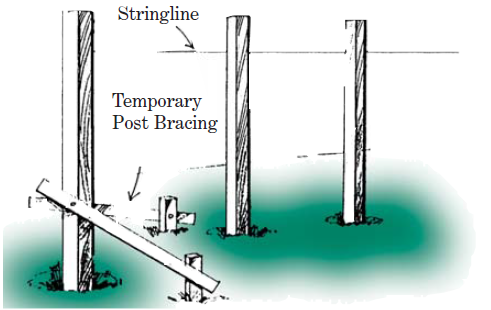 Attach the string line on the end posts at the required height of each rail, and mark out the appropriate position on each intermediate post. 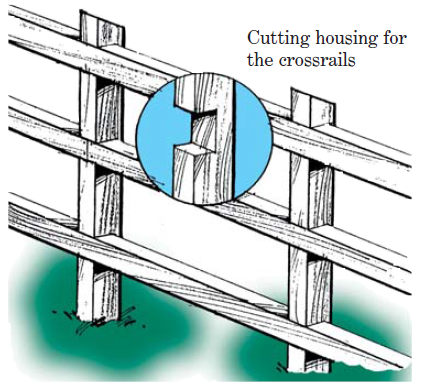 Most picket fences have only two cross rails, with the top rail 150mm down from the top of the posts, and the bottom rail 150mm above the plinth. 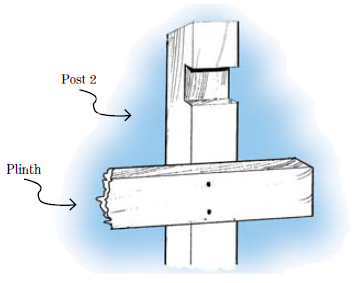 Use a saw and chisel to cut the notches in the posts the same depth as the thickness as the rails. Fix the rails to the posts with two 75 x 3.75mm galvanised bullet head nails. Joins in the rails should be butted together in the centre of the post notch. Stagger the joins in the rails over different posts. When the rails are in place, locate the plinth at the base of the posts. The plinth is fixed on the face of the posts - it is not notched in. Plinths should run parallel to the ground, and a little above it. Use small packers to sit the plinth on before fixing in place. Fasten the plinth with two 75 x 3.75mm galvanised bullet head nails. At this stage it is necessary to select the shape along the top of the fence - straight or curved. For a straight top use a stringline along the posts to line up the pickets. A curved top can be created by also using a stringline, allowing it to go slack in the middle to the desired shape. Measure the distance from the low point of the string to the plinth, and use this measurement to establish the same curve for the other bays. When fixing the pickets it is important to make them evenly spaced. The usual gap is between 25 to 35mm. Fix the two end pickets (checking for true vertical with a spirit level) and then work from one end using a “spacer” to keep the gaps uniform. Fix the pickets with two 50 x 2.8mm galvanised bullet head nails to each rail. Finishing touches are important to make your fence as attractive as possible. For example, top the posts with “capitals” as illustrated below. When exposed to the weather, all timbers eventually lose their colour and turn grey. Therefore the application of a coat of paint (or stain) will enhance the appearance of the fence, as well as provide additional protection from the weather. Several types of paints and stains are suitable for external use, your Home Timber and Hardware experts can help you select the right colour and paint types for your project. galvanised fasteners for all outdoor fixings. plastic to protect from the weather. Measure all lengths twice before cutting. When using power tools, wear eye goggles, ear muffs and protective clothing. Pre-drill nail holes slightly undersize (especially pickets) to prevent the timber from splitting. IMPORTANT: This instruction leaflet has been produced to provide basic information and our experienced staff are available to answer any questions you may have. However, the use of this information is on the understanding that Home Timber and Hardware (including its author, owners and proprietors) disclaim all and any liability for any damages or other amounts found to be recoverable resulting from such information, even when given negligently or attributable directly or consequentially upon any act or omission of Home Timber and Hardware. Should Home Timber and Hardware be found liable in any way for the information provided, the user acknowledges and agrees that such liability shall be deemed null and void. The user is advised to call in a qualified tradesman, such as an electrician or plumber, where expert services are required. WARNING: there may be by-laws or regulations of councils or statutory bodies that need to be fulfilled in the leaflet.